10 TIPS FOR PRESERVING VITAMINS AND SHELF LIFE IN PRODUCE! This is an excellent post of suggestions for quick food storage and Nutrition tips. Note though that Ayurveda does not recommend freezing your food. Although some scientific studies may show that water soluble nutrients like Vitamin C may be partially retained during freezing, Ayurveda focuses on the prana or energy of the food and its aliveness. Freezing halts this life force and is therefore less favorable if you can avoid it. The author of these tips also mentions oxidation and the loss of nutrients over time with freezing at the end of her section. The rest of the tips are Golden! Americans throw away thousands of dollars every year in spoiled produce. Try these tips for making your goodies last longer. We’re all trying to eat healthier by choosing more fresh fruits and vegetables. But just how many of those good nutrients are we actually getting by the time we eat these foods? Today’s produce is not only shipped from the farm, but then shipped home to our houses and stored in the refrigerator for several days up to a few weeks. The truth is that once picked, vegetables’ immediately start to lose their nutritional value. According to one study in 2010, fresh vegetables can lose up to 45 percent of their nutritional value between being picked and landing on a grocery store shelf. Add in the time it takes to get the vegetables home and actually on your plate, and you could be consuming less than a third of the nutrients you’d expect. Following are some tips for getting the most bang for your buck when it comes to healthy produce. Researchers from the U.S. Department of Agriculture’s Agricultural Research Service wanted to know if it’s better to buy the spinach in the front of the rack, where it’s exposed to more light, or in the back, where it’s darker. They grew two varieties for two months, harvested and stored them, then measured nutrient levels. Results showed that with even as little as 24 hours of continuous exposure to grocery-store lighting, the bags of spinach in the front had higher nutrient levels than the very-same-age bags in the dark. Some key nutrients, like folate, were significantly higher in the lighted spinach—9 times higher, actually. Results also showed higher levels of lutein, beta-carotene, and vitamin K.
Most of us know this by now, but it’s a good reminder. Buying directly from a local farmer reduces the shipping and storage time, helping you to get more nutrients from your food. Bonus—recent studies have found that items at farmer’s markets are typically cheaper than they are at neighboring supermarkets. Studies comparing frozen with fresh vegetables have found that the frozen ones kept more of their nutrients than fresh—as long as they were frozen shortly after harvest. Researchers found that though most shoppers believe fresh veggies sold in supermarkets are less than four days old, they’re closer to nine days old or more when they arrive, then remain on the shelves for a further four. At home they’re stored again, which means they could be at least 16 days or a half-month-old by the time you eat them. According to research from the Institute of Food Research—admittedly funded by Bird’s Eye foods—fresh beans lost up to 45 percent of nutrients, broccoli and cauliflower 25 percent, garden peas up to 15 percent, and carrots up to 10 percent. Meanwhile, frozen peas contained up to 30 percent more vitamin C than fresh, and green beans contained up to 45 percent more than fresh. In an earlier study published in Food Chemistry, researchers measured vitamin C levels in fresh and frozen produce, and found that that nutrient content of frozen peas was superior to peas that had been stored in-home for several days. The nutrient status of frozen whole green beans and carrots was similar to the fresh vegetable at harvest. Frozen spinach was also superior to market produce. Look at the packaging date, however, if you can. Though produce loses fewer nutrients upon being frozen then when heated for canning, they can gradually lose those nutrients over time while in the freezer due to oxidation. On the whole, younger produce is more nutritious than older. Go for the baby spinach rather than the mature spinach, for instance. Research found that the leaves of the younger types are more biologically active, and always have greater nutrient density than the older ones. The same held true for other vegetables, including mustard greens, collards, and kale. Researchers have discovered that if you cut fruits and vegetables and then leave them out on the counter or store them, they will lose from 10-25 percent of antioxidants like vitamin C and carotenoids over a period of 5-6 days, because of the exposure to oxygen. Similarly, avoid cutting up lettuce or other greens, as that cuts into the pores, releasing compounds that speed up ripening and spoilage. It may be convenient to cut up veggies and store them in bags in the fridge for snacking, but realize that you will be losing nutrient power and potentially speeding up the degradation of the food. It’s best to wait and cut them right before eating, instead. Ordinary mushrooms have little or no vitamin D, but those grown under UV light turn an interior plant sterol (ergosterol) into vitamin D. Many portabella mushrooms are now exposed to light, but you can also expose other types at home by leaving them out on the counter under the light. Some growers also note on their labels that their mushrooms are UV-enhanced. Cooking can destroy antioxidant carotenoids like beta-carotene, lycopene, and lutein. Boiling makes it easier for nutrients to leach into the water, and over-cooking via any method diminishes nutrients by breaking down the cells. To preserve the most nutrients, steam, stir-fry, and sauté, and use a tight-fitting lid when possible. On the whole, more nutrients are preserved when there is less contact with water, shorter cooking times, and less exposure to heat. Cook fruits and vegetables with their skins on. Also, don’t rinse grains like rice unless the package advises it—washing can take away as much as 25 percent of vitamin B1. In most cases, washing both encourages spoilage and speeds up the formation of mold, so hold off on the washing until right before you’re ready to eat. Washing removes the outer layer, causing faster ripening, particularly on berries. 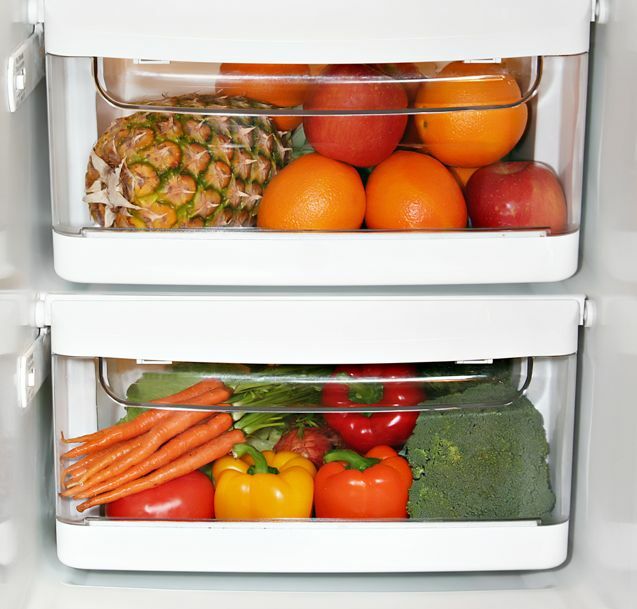 Separate fruits from vegetables by storing in different drawers, and don’t over pack. Remove ties and rubber bands, and store loosely in perforated paper, plastic, or cloth wrapping, or in a glass container. (Note: tomatoes are best stored on their own. Tomatoes stored in plastic are likely to ripen more quickly.) Also, avoid storing in air-tight bags, as these will suffocate the food items and speed up decay. Most veggies are best stored in the crisper, though tomatoes work better on the counter left upside down. Garlic, onions, potatoes, shallots, sweet potatoes, and winter squash live best in a cool, dark pantry. If you’re into juicing, you may be tempted to save time by making enough for two glasses, then saving that second glass for the next day. You’d be shortchanging yourself, however, as that second glass will not be as nutritious as the first. Your best bet for preserving nutrients is to drink fresh juice immediately after you make it. Find more tips for preserving nutrients during storage and cooking for many individual fruits and vegetables at Farm Fresh to You. Do you have other tips for preserving nutrients or shelf life of fresh foods? Please share them with us. Joshua Horrocks, “Institute of Food Research: 45 percent nutrient loss in grocer vegetables,” Examiner, March 5, 2010, http://www.examiner.com/article/institute-of-food-research-45-percent-nutrient-loss-grocer-vegetables. “Veggie Smart: How to Preserve Vitamins,” Nutrition Action, October 2012. “New Study Compares Prices at Farmers’ Markets and Supermarkets. The Results Might Surprise You,” Politics of the Plate, May 10, 2011, http://politicsoftheplate.com/?p=864. Sean Poulter, “Why frozen vegetables are fresher than fresh,” Daily Mail, Marhc 5, 2010, http://www.dailymail.co.uk/health/article-1255606/Why-frozen-vegetables-fresher-fresh.html. Joy C. Rickman, et al., “Nutritional comparison of fresh, frozen, and canned fruits and vegetables. Part 1. Vitamins C and B and phenolic compounds,” Journal of the Science of Food and Agriculture, 87: 930-944 (2007), http://ucce.ucdavis.edu/files/datastore/234-779.pdf. María I. Gil, Encarna Aguayo, Adel A. Kader. “Quality Changes and Nutrient Retention in Fresh-Cut versus Whole Fruits during Storage.” J. Agric. Food Chem., 54 (12), 4284 -4296, 2006. 10.1021/jf060303y S0021-8561(06)00303-7. United States Food and Drug Administration. “Raw Produce: Selecting and Serving it Safely.” Accessed February 10, 2012.http://www.fda.gov/Food/ResourcesForYou/Consumers/ucm114299.htm. “Preserving Nutrients in Food,” University of Kentucky, 1994, http://www.ca.uky.edu/hes/fcs/factshts/FN-SSB.006.PDF. D.J. Favell, “A comparison of the vitamin C content of fresh and frozen vegetables,” Food Chemistry, 1988, 62(1): 59-64, http://www.sciencedirect.com/science/article/pii/S0308814697001659. Colleen M. Story, a northwest-based writer, editor, and ghostwriter, has been creating non-fiction materials for individuals, corporations, and commercial magazines for over 15 years. Her specialty is in the health and wellness field, where she writes and ghostwrites books, e-books, blogs, magazine articles, web copy, newsletters, research-based projects and more. Colleen is a self-described health nut, and understands from experience that “junk” foods and lack of sleep lead to fuzzy thinking, which isn’t helpful when facing project deadlines! She enjoys interviewing top scientific researchers, alternative medicine gurus, and cancer survivors from all over the nation who have overcome great challenges to find new purpose and vitality in life. In telling their stories and sharing their insights, she feels a sense of belonging in a wider community of individuals who seek to experience life in the most vibrant way possible. Good article! A good reminder of some things I knew but I’d never heard that about the dark/light. Tip that works for me re keeping veggies in fridge fresh: I used bluapple, a little blue plastic apple you can buy in the grocery store. The apples come with a year-refill kit of sachets that you change every 3 months. I put one apple in each vegetable bin and it does work. I don’t work for blueapple, BTW!